The man who sparked outrage last year by hiking the price of a life-saving drug may have met his match in some Australian schoolboys. US executive Martin Shkreli became a symbol of greed when he raised the price of a tablet of Daraprim from $13.50 (£11) to $750. Now, Sydney school students have recreated the drug's key ingredient for just $20. Daraprim is an anti-parasitic drug used by malaria and Aids patients. 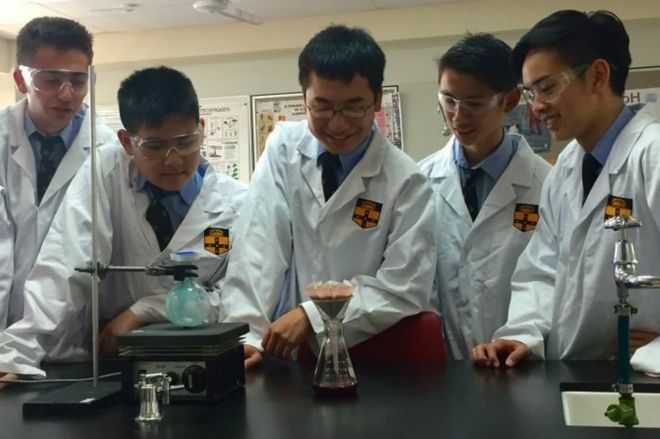 The Sydney Grammar boys, all 17, synthesised the active ingredient, pyrimethamine, in their school science laboratory. "It wasn't terribly hard but that's really the point, I think, because we're high school students," one boy, Charles Jameson, told the BBC. The students produced 3.7 grams of pyrimethamine for $20. In the US, the same quantity would cost up to $110,000. In most countries, including Australia and Britain, the drug retails for less than $1.50 per pill. See? Drugs companies are among the greediest dirty bastards in the world! That's why I have reservations about every drug that is thrown at people so readily. Drugs make huge profits and we, the public, swallow their little pills and take their poison without really knowing what we're doing. Not a scientist, researcher or inventor, he didn't develop the drug in question --but simply bought the company that had the rights to that drug ! Not an entrepreneur or developer, but simply a monied-up-cnut who throws money around freely, aiming for maximum return at others' expense..
Not particularly intelligent, smart or astute, but simply another mongrel minded white collar criminal profiting from his ill gotten gains.. The ugly side of capitalism, in a world where there are still too many people out there prepared to cheer on scum like him, who are simply privileged crooks managing to keep his slimy nose clean.. The lowest of the low, in that corporate elite. You don't like him then? nicko wrote: You don't like him then? yes that him Martin Shkreli. the Kids started the project because of him doing that. veya_victaous wrote: yes that him Martin Shkreli. I said "you don't like him then" was an attempt at a joke. I quite often make a joke, but few on the left [and the right] don't seem to get it. I might give up trying. I knew you meant it as a joke; I've heard it a few times before..
» Can you Recreate a Deleted Moderator Group?